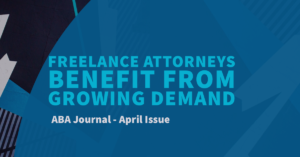 The ABA Journal published an article in its April issue entitled “Freelance attorneys benefit from growing demand,” by Danielle Braff. The article mentions Montage Legal Group as a company created to connect freelance lawyers with law firms, and explores the benefits of working with vetted freelance lawyers through platforms like Montage. The article explains how freelance lawyers are independent consultants, and set their own rates per project. The article also discussed additional benefits including having control over one’s finances, and freedom to control one’s own schedule. The article highlights how freelance lawyers can benefit law firms, which include allowing firms to move cases faster, handle larger caseloads, and even obtaining help with web content. To read the full article, click here. Montage was featured in the ABA Journal almost 8 years ago, in an article that attributed the term “freelance lawyer” to Montage’s founders: “Laurie Rowen and Erin Giglia would like to add a new work status to the law dictionary: freelance.” (See Freelance Law: Lawyers’ Network Helps These Women Keep a Hand in the Workforce – August 2011). Montage’s platform has grown from 24 lawyers at that time to over 200 freelance lawyers today. Montage intentionally keeps its network small and limited to lawyers who graduated from top law schools and worked at prestigious law firms. Montage is always grateful to be discussed in the press, especially in excellent magazines like the ABA Journal. Thank you to Danielle Braff for including Montage in this article!